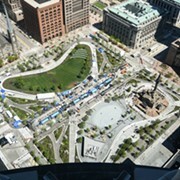 A year ago, the multi-panel RTA bus used as a visual aid at Clevelanders for Public Transit (CPT) events had "Public Square" scrawled in orange paint at the top. 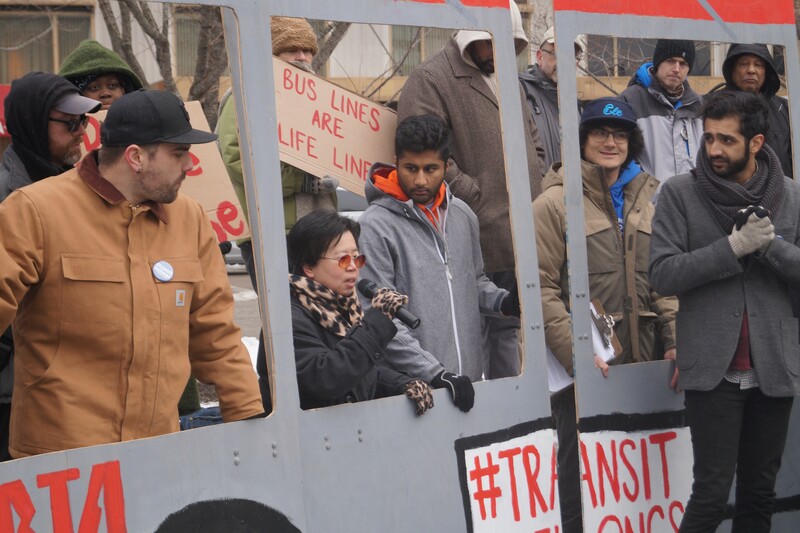 Back then, the local transit advocacy organization was rallying for buses to return to a pivotal strip of Superior Avenue downtown. 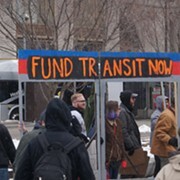 Monday evening, as CPT rallied for an affordable and fully-funded regional transit system (in view of that pivotal strip), the bus read "Fund Transit Now." 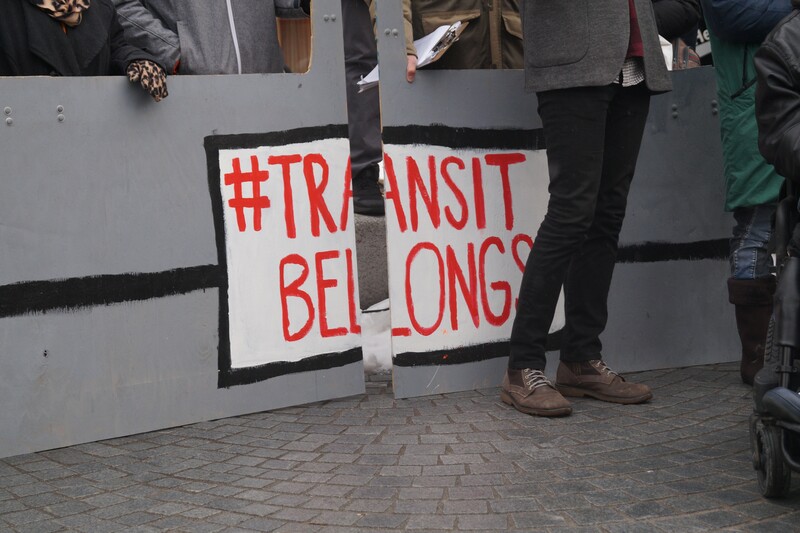 Standing behind the prop — one of the most memorable and effective at local organizing events of the past several years — demonstrators called for a transit levy on the November ballot and demanded action from county officials to repair the system in the midst of its death spiral. 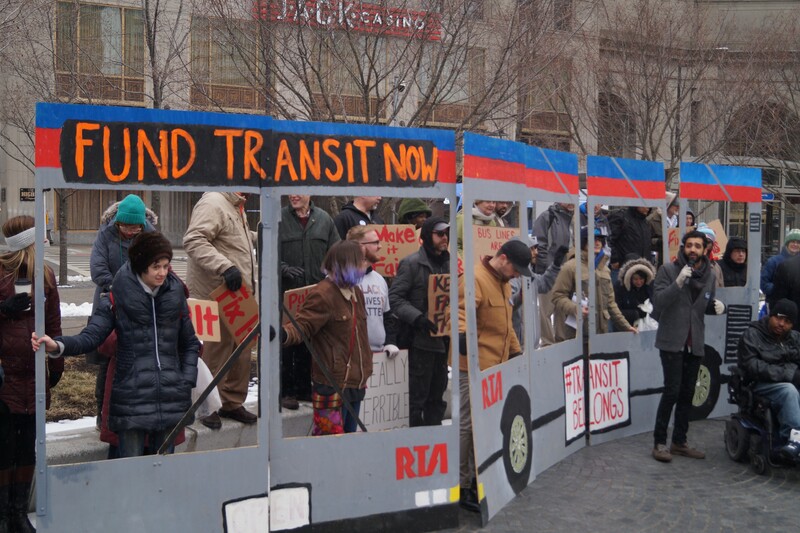 The rally came less than a month after the publication of CPT's #FairFares initiative, which proposed sweeping reforms to RTA. 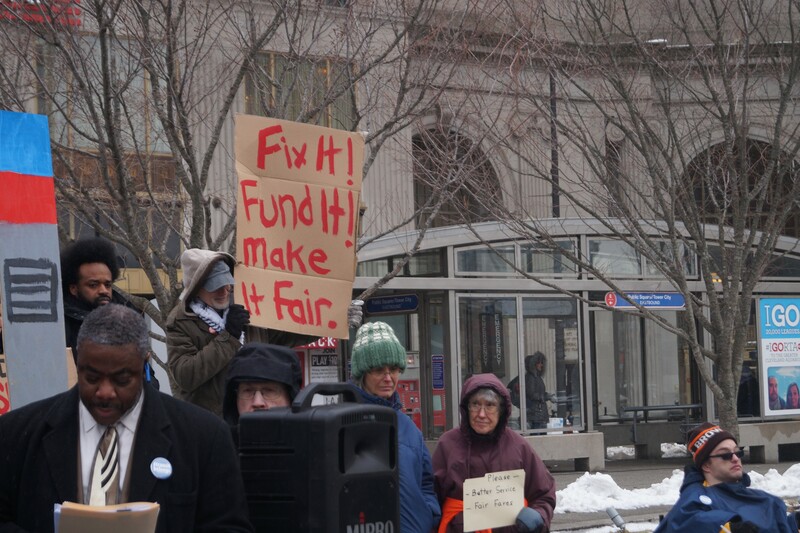 Those reforms, and Monday's rally, were premised in part on the notion that financial aid is not coming from Columbus. Governor John Kasich and the Ohio General Asssembly have presided over a precipitous decline in transit funding. Ohio is now ranked 45th among all states in that category, behind the likes of Iowa, Vermont and Alaska, states that each have smaller populations than Northeast Ohio alone. And while Ohio has provided some "soft-landing money," in the words of RTA CEO Joe Calabrese, the loss of revenue from taxes on Medicare managed care organizations (MCOs), has translated into service reductions and staff cuts. The MCO tax accounted for about seven percent of RTA's annual budget. "We can't wait for the Feds. We can't wait for the state," said CPT organizer Akshai Singh, Monday. "We know that we need to be pushing back on this locally. 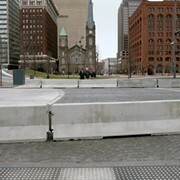 And this is something that is only going to get worse if we don't have more local solutions." 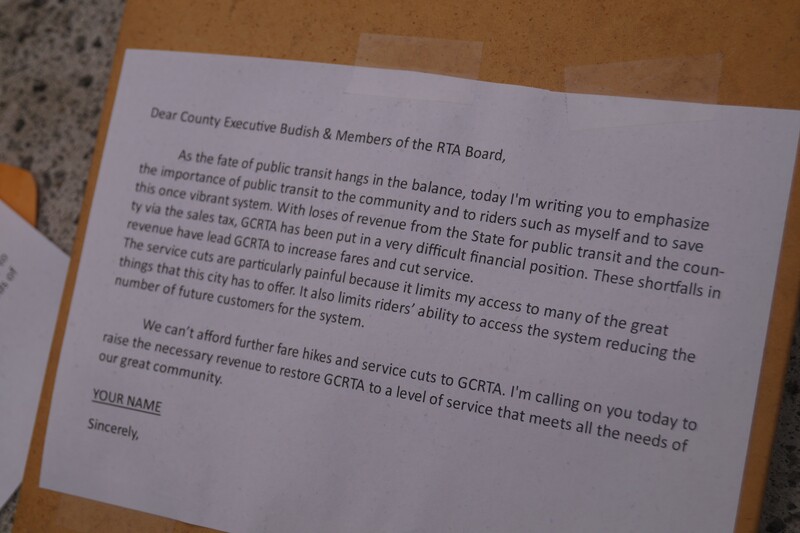 "We can't afford further fare hikes and service cuts to GCRTA," read a circulating letter that attendees signed (image below). "I'm on calling on you [County Executive Armond Budish and Members of the RTA Board] today to raise the necessary revenue to restore GCRTA to a level of service that meets all the needs of our great community." Two paratransit riders, a representative from SEIU Local 1, a rep from the Amalgamated Transit Union (the union that represents RTA drivers), a longtime transit user and a homeless advocate all spoke passionately about the positive impacts of public transit on their lives and the need for affordable buses and trains. One longtime rider, Lynn Solomon, reflected on the age of free transfers. "Do you remember when one fare would get you from home to wherever you needed to go no matter how many buses you needed to take?" She asked. "Those were the days when RTA was great." Rider Greg Stuart noted how critical Paratransit service was for his daily life. "For those of us with disabilities, public transit is everything," he said. Akshai Singh, who served as the event's MC, discussed the possibility of a November levy to address the funding shortfall and explained that the RTA's board members are appointed by County Executive Armond Budish, Mayor Frank Jackson and the regional mayors association. "This isn't just for the 10 people on the RTA board," Singh said. "We need the county — every mayor in Cuyahoga County — behind the RTA board to make sure that riders in their communities are served, to make sure that jobs in their communities are reachable. We can't get to NASA. We can't get to Ursuline. We can't get to Progressive. They wanted to bring Amazon here... [but] we got nothing." The tax levy may be a tough pill to swallow for a county with the highest sales taxes in the state, but it would be of much greater value to the region than the quarter-cent sales tax increase that paid for the husk known as the Global Center for Health Innovation, which is re-branding to salvage itself from total humiliation. CPT's organizing efforts have borne fruit recently. Last month, the RTA board announced that they would likely postpone a fare hike scheduled for August. “We need to take a look at the possibility of modifying our fare structure to best assure fairness and equity to our customers,” said Joe Calabrese at the time. “It’s critical that we study if there is a way to join with community partners to offer lower fares for our customers with lower incomes."